Can a Scatterbrained Writer Get Organized with Scrivener? In a recent post I mentioned Scrivener, which is a word-processing and project management tool. The Scrivener site calls it a “complete writing studio.” I tried the Windows version when it was in beta testing, but trying to learn how to use new software while in the middle of writing a novel slowed me down. And though I loved the organization part, I felt the word-processing part was lacking. Guess what I’ve been doing this past week? Yep, I downloaded the current free trial version of Scrivener for Windows, and I’ve been setting up Projects for my two WIPs. I still love the Corkboard and Binder and all the other organizing bits, but in the current version I’m also happy with the word-processor function. And I hear Scrivener easily converts your work to digital files now too! Click the photo to view in detail. No more do I have to open ten Word documents and switch back and forth between them. In Scrivener I can still create as many files as I need for each Project, including character sketches, style sheets, editing notes, unfinished scenes or ones I haven’t decided where to fit in yet, and all those web links and bits of info culled during research. But the difference is it’s all in one place and easily accessed from one screen! I’ve enjoyed adding photos of celebrity stand-ins to my character sheets and index cards, and now I can just click the Corkboard view whenever I need to get newly inspired. I’m also adding photos for the locations where my story takes place and any other photos that I’ve gathered during research. Some quick and easy editing features are the ability to take a “snapshot” of a scene before you edit it. Those versions are listed on the right-hand side of the screen, accessed with one click, and can be viewed in split screen mode to review changes or copy and paste from, if you decide you like the original better. And if a scene needs to be moved, just drag it into proper order in the Binder. Please click on my graphic above to view it larger. This is a view of the Project for my WIP with the working title Fish (this is incomplete and first draft state—so cut me some slack.) As you can see, I’ve divided my chapters into scenes to work on individually, but if I want to view the chapter as a whole, I only need click on the “Scrivenings” button at the top and voilà! And I can change the colors or icons for key chapters or scenes—including the color of the Editor background, so if I get the urge to write a sweet first kiss scene in purple font on a pink background I can do that. One application of the color settings is to see at a glance the structure of your novel. For instance, in this WIP, I’m using two colors to denote which scenes are in which character’s viewpoint. I also use a third color for front matter pages and a fourth for back matter pages. I could go on and on—there’s the multi-purpose split screen mode, templates (if you want them), compiling for print or export (yes, you can convert to Word documents) and much more, but this post is a whopper already. And besides, others can tell you about it better than a newbie can. Users who love Scrivener are vocal about it. There are numerous videos, articles, and blog posts showing how to use various functions of the program. One such user is Lucinda Whitney who wrote a terrific article, complete with screen shots, titled “What I Love About Scrivener.” She also maintains a Scrivener Pinterest page with links to many other helpful articles. I learn something new about Scrivener each day I use it, but I quickly learned all I need to know to get organized and start making better use of my writing time. By the way, there’s a Mac version with even more features than the current Windows version. So why not check out the free trial? At least watch the introductory video to see whether Scrivener might be useful for you. So YES, to answer the question in the post title, I believe this scatterbrained writer can get organized with Scrivener. My trial period will run out in less than three weeks—it runs for 30 full days, no matter how many times you use it during those days—and this time I’ll be paying to register it. Finally, my brain feels uncluttered, which relaxes me and that’s always good for getting the words to flow. 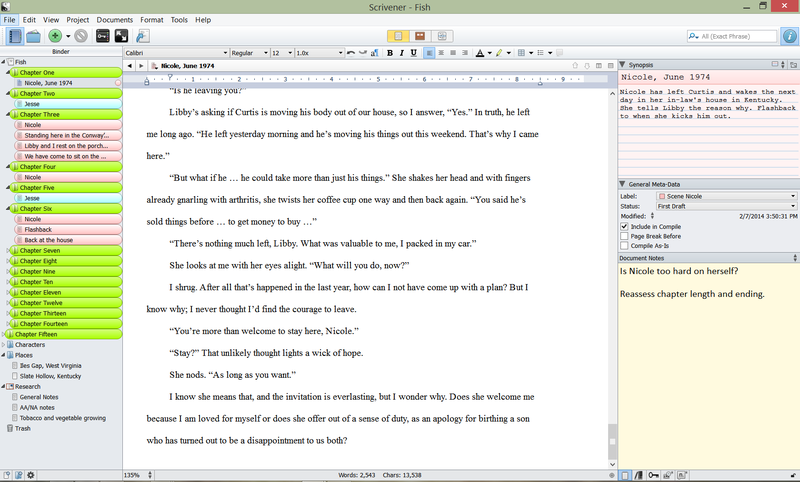 I’ve been using Scrivener for Windows for quite a while now, and I probably have explored 40% of it. Don’t worry about “too many features.” You only need the basics to get started. Thanks for the link to Lucinda’s Pinterest board — I wondered where some of my blog visitors were coming from!